The project could revolutionize conservation efforts around the globe. The Galapagos Island of Seymour Norte, off the coast of Ecuador, has a vicious invasive rat problem. Despite efforts to curb the spread of the rats in 2007, conservationists found the tiny island was infested yet again a decade later by two common rat species. This time, they employed a high-tech solution to fight the vermin: autonomous drones that fly along predetermined paths and drop bombs of rodent poison, Wired reports. Invasive rodents have decimated native species like iguanas and a number of birds by eating their eggs, and offspring. On an island like Seymour Norte, a single mammal species like the rat can quickly upend a delicate ecosystem. The government of Ecuador partnered with Island Conservation, an American non-profit, to devise a solution: six-rotor drones specially designed to drop an immense 44 pounds of rat poison pellets per trip. The drones are launched from a boat near the island and fly autonomously along a pre-programmed route, dropping pellets as they go. 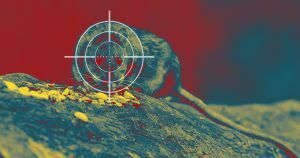 A total of 6,600 pounds (3,000 kilograms) of rat poison were produced for the eradication, according to a press release. The operation has reportedly been successful. According to the team, the rodent infestation is almost entirely banished from the island, giving an Island Conservation spokesperson hope that the system could be used in other areas.